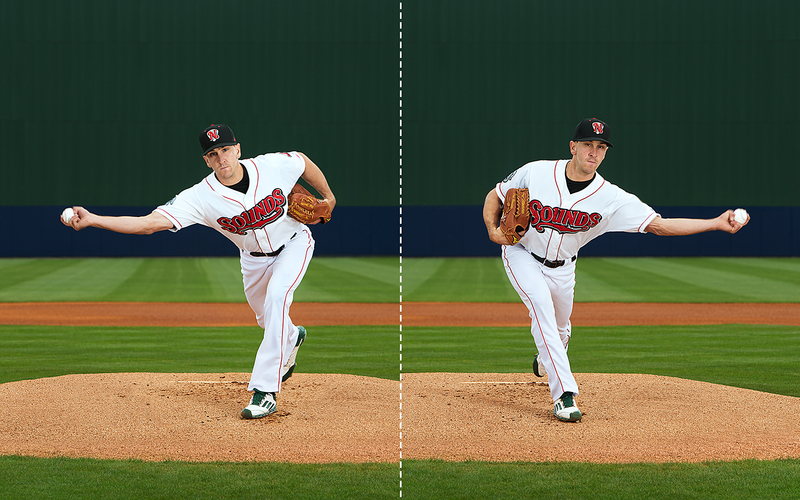 Behold switch-pitcher Pat Venditte, living proof that self-belief can conquer nature's curse. HIS NEW GLOVE is jet black, with gold stitching. 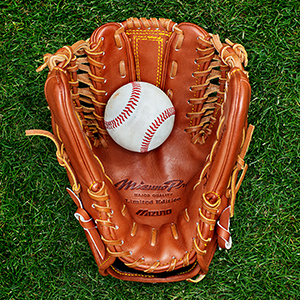 From afar, it looks like any other mitt, but up close, it is unlike any glove you've seen. It has six fingers, or four fingers and two thumbs, with a small nest of a pocket in its middle, splitting the half-dozen digits precisely in half. It looks made less for a hand and more for a paw. The man can remember the first time he held a six-fingered glove. He was 7 years old. His father had searched for one that could accommodate the skills of his special boy, and he discovered that Mizuno in Osaka, Japan, had made one. In 1995, a man with a mustache had pitched a single major league inning as a switch-pitcher for the Montreal Expos: He threw with his right hand to two right-handed hitters and with his left hand against two lefties, flipping his custom-made Mizuno glove in between. A switch-pitcher hadn't appeared in a big league game since 1894; none has appeared since. In more than a century, there has been one, for one inning, making them an almost mythical breed, the most rare of baseball creatures. The father had called Osaka several times before he found someone who could understand or perhaps believe his request and its consequences: There is another one. He had his boy put each of his hands flat on a piece of paper and traced them, and then he faxed the pages to Mizuno. Several months later, he took a trip from the family home in Omaha, Nebraska, to San Francisco and picked up the glove after its journey across the ocean. It was in a black box. When the father came home, his boy was waiting for him at the airport. Now a 29-year-old man, he can remember perfectly the moment he opened the box and saw the glove that had been made just for him. It made real what sometimes even he could only imagine. He still gets a charge whenever a new one arrives. It's as though each glove reminds him of everything he defies, how complete his otherness is. Mizuno's most senior craftsman made the newest black mitt. What must he imagine about the man who wears his glove? In Japan, the highest compliment a baseball player can receive is kaibutsu: That man is a monster. Does the Japanese craftsman believe that he's working on behalf of some strange animal, that he's a saddle maker for a unicorn? Did he look at the six-fingered glove after he had finished it and think: What kind of beast? Pat Venditte has been pitching with his left and right hand since the age of 3 and is now a minor leaguer in the Athletics organization. In this excerpt from a 2009 E:60 feature, find out how the intriguing prospect learned his unique skill set. PAT VENDITTE, IN jeans and a T-shirt, stands in an empty one-bedroom apartment with his wife, Erin, and the woman with the keys. They drove here from their temporary digs in downtown Nashville in their red Jeep, Nebraska plates, stuffed with their clothes and his golf clubs. Venditte looks around for less than a minute before he announces he's happy. Erin agrees. "We've found a home," Venditte says. He laughs, remembering his shadier accommodations over the course of his minor league career, four players wedged into a two-bedroom, his air mattress blown up under the dining room chandelier, a clutter of lawn chairs in place of couches. He recalls one desperate stretch when he and his roommates found an electronics store that would take back a TV, no questions asked, within 30 days of purchase. They bought a lot of TVs for 29 days. Now, after serving seven years in the Yankees' organization, the long man, the innings eater, topping out at Triple-A Scranton/Wilkes-Barre and with winter ball stints in places as far afield as Venezuela, an alien twice over, he's declared himself a free agent and signed a minor league deal with the angle-shooting, value-seeking A's. "I just felt like they wanted me the most," he says. After a solid first Oakland spring, he has landed with the Nashville Sounds, finally making more than the Triple-A minimum of $2,150 a month. This is the first year he can afford to have Erin join him for the season -- they met in college at Creighton -- and she's left her job back in Omaha for the electrical storms of a minor league summer. They are as close to their dreams as they ever have been. It's still proving hard for Venditte to snap his farm-system habits, all those years spent living as though on the lam. In the apartment complex's sunny office, the woman with the keys makes a face when he tries to pay the deposit with wadded-up cash. He confirms that they'll be on a breakable month-to-month lease before he signs the paperwork. He uses his right hand. When Venditte tries to write with his left hand, his signature turns into an illegible scrawl. Eating with his left hand is a good way for him to end up with a dry cleaning bill. In any universe other than baseball, he is indisputably right-handed. The golf clubs tell as much. The only thing he can do with his left hand as well as he can with his right is perhaps the hardest thing in the world: pitch. He can throw a fastball, a slider and a changeup with either arm, and there isn't much between each version. His right-handed fastball is a little harder; his left-handed slider is a little sharper. His delivery -- a deceptive, unconventional sidearm -- is virtually identical from either side. More than once, Venditte has been mistaken for opposite-handed twins because he'll warm up before games with one hand with the starting pitchers and with the other hand with the relievers. Every appearance turns into an audition for a new audience of disbelievers and gawkers who have come to see the freak of nature, the carnival geek. Even here, on the cusp of the major leagues, he still isn't free from his lifelong burden of proof. On June 19, 2008, in Venditte's professional debut with the Staten Island Yankees, the fourth batter he faced, Ralph Henriquez of the Brooklyn Cyclones, was a switch-hitter. There were two outs in the bottom of the ninth. In the on-deck circle, Henriquez had warmed up as a left-hander. When he entered the batter's box, Venditte had his glove on his right hand, tipping that he was going to throw left. Then Henriquez stepped in right. Venditte switched his glove to his opposite hand. Henriquez switched sides, and so did Venditte. Then they switched sides again. "Boy, I have never seen anything like this," one of the broadcasters said. (An eight-minute video of the at-bat has been viewed more than a million times on YouTube.) Finally, the umpires ordered Henriquez to step in. He went right, and so did Venditte. An enraged Henriquez struck out on four pitches, ending the game and modern baseball's first switchy-switchy matchup by clubbing the dirt with his bat -- with his left hand. By July 2, the Professional Baseball Umpire Corp., after consulting with the Major League Baseball rules committee, announced what has become known colloquially as the Venditte Rule: A switch-pitcher has to declare which hand he is going to use first. The rationale was that so much baseball strategy, such as the use of pinch-hitters, had been predicated on opposing managers knowing the pitcher's hand. Venditte was that calamitous invention that risked erasing a century of history and understanding. Some players change their position by the way they play it; Venditte was trying to change the entire game. But Venditte plays baseball, empire of the orthodox, and he played it for seven years in an organization that insisted on collared shirts and forbade long hair and beards. The Yankees taught him how to be a professional, how to do the work. They also taught him that institutions aren't interested in experiments when they can afford certainty, and that there is no easier lie than "Rules are made to be broken." Not if you want to play baseball, and especially not if you want to play baseball in New York. Luckily for Pat Venditte, baseball is also played in Oakland. THE HUMAN BODY, like the games we play with it, presents a tidy illusion of symmetry and parity covering a host of fundamental imbalances. Each is a system of levers, one long application of pressures followed by an equally long search for relief from them. In baseball, pitchers facing like-handed batters have the advantage. They are the pressure. The ball is hidden from the hitter for a quarter-second longer; breaking balls generally tail away, off the end of the bat. Because Venditte can throw with either hand, he can always hold the advantage, even, in some ways, against switch-hitters. He can push them to their weaker side, or force them to hit into the wind or toward the longer field of a ballpark, shorting out their power. If there's a man on first, he might choose to pitch left-handed to improve his potential for a pickoff. 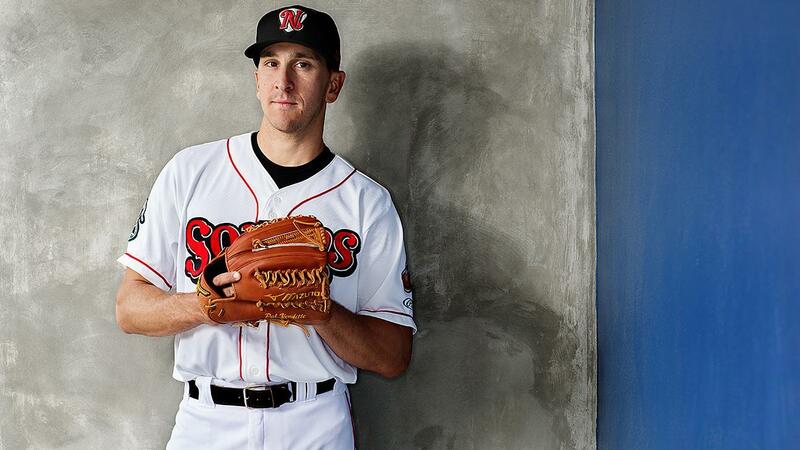 "The percentages are always in his favor," says Don Schulze, Venditte's pitching coach withthe Sounds. "As long as he's in command, the house is always winning." Handedness -- why most humans have a dominant hand, and why most of them are right-handed -- remains a relative mystery. A 2013 study published in PLOS Genetics found that a complex network of genes likely dictates your dominant hand, along with your dominant foot, eye and ear. One gene in particular, PCSK6, seems to play a considerable role: It helps build our asymmetrical body parts in utero. (When scientists blocked the effects of PCSK6 in mice, their organs were misplaced or reversed.) The wiring of the brain is also imbalanced -- for instance, most but not all of us process language in the left hemisphere, and the same holds true for motor function. Because handedness is such a deeply embedded trait, as fundamental as our currents, perhaps it's not surprising that only about 1 percent of the population is truly ambidextrous. In fact, a 2010 Finnish study suggests that mixed-handed children are more likely to suffer from learning and language difficulties. Their flawless outward symmetry might betray serious problems with their internal circuitry. Ambidexterity is, in the truest sense, unnatural. But our handedness isn't totally immune to influence. Roughly half of Canadian major leaguers throw right-handed but bat left, which is believed to be the population-wide impact of childhood hockey, in which the dominant hand settles at the top of the stick, making a left-handed shot the norm. (This has presented a problem at tournaments like the World Baseball Classic for the Canadians, who have ended up with as many as eight left-handed hitters in their heavily weighted lineups.) And nearly 15 percent of major leaguers are switch-hitters, the vast majority of whom are natural righties who learn how to bat left. Some even achieve a near perfection in their versatility. Tim Raines batted .293 right-handed and .294 from the left; Chipper Jones hit .303 as a lefty and .304 from the right. Given the asymmetry of human engineering -- the relative masses of hearts and livers alone -- that sort of twin mastery seems as though it should be impossible. When Pat Venditte was a toddler, he was obsessed with playing with a ball. He'd throw it against the stairs and catch it, over and over again. His father, Pat Venditte Sr., was a catcher who played through college and still plays today, at 69. He watched his son throw his ball, and he had to admit to himself that the boy didn't seem particularly strong with either hand. Why did he have to choose? "It seemed like the natural thing to do," Venditte Sr. says today of his most unnatural proposition. The high school physical education and health teacher, a man who taught the 10 systems of the human body, decided he would treat each half of his son the same. Nature might eventually reveal a dominant side, but each would be nurtured equally. Father and son spent an extraordinary number of hours playing catch, left- and right-handed: at 6 in the morning, during lunch hour and in the evenings, under floodlights, sometimes until midnight. They both loved it, a shared addiction. "I don't know why I didn't kick back," Venditte says. "I think that has a lot to do with my dad's attitude toward the situation. He never put too much pressure on me." They still work out together every offseason. The nail on Venditte Sr.'s ring finger is only half grown back after its traumatic removal by a fastball last fall. Venditte Sr. is warm and charismatic, the sort of man who makes you wonder why you haven't done more wondering. He managed to persuade officials at local stadiums and high school gyms to hand over the keys so he and his boy could extend their experiment through the Nebraska winter. Knowing that pitching wasn't just a function of arm strength, Venditte Sr. also had his son kick footballs with his left and right legs, punting them high into the air. Venditte's left side was always weaker -- DNA can seem a nearly irresistible force -- but by overriding his genetic predisposition with muscle memory, he blurred the line between dominant and recessive. Although the occasional left-hander has popped up in the family tree, the Vendittes don't believe Pat was particularly suited to switch-pitching beyond his unshakable faith in it. His mother, a nurse named Jan, had him play violin, and she sometimes likes to think that the music had something to do with it, unlocking some primordial part of his brain, opening each half of it to the other. Mostly, though, Pat Venditte was made, not born. He is an object of choice, not fate. He has quite possibly thrown more baseballs than any other man his age in history because he's had twice as many arms with which to throw them. 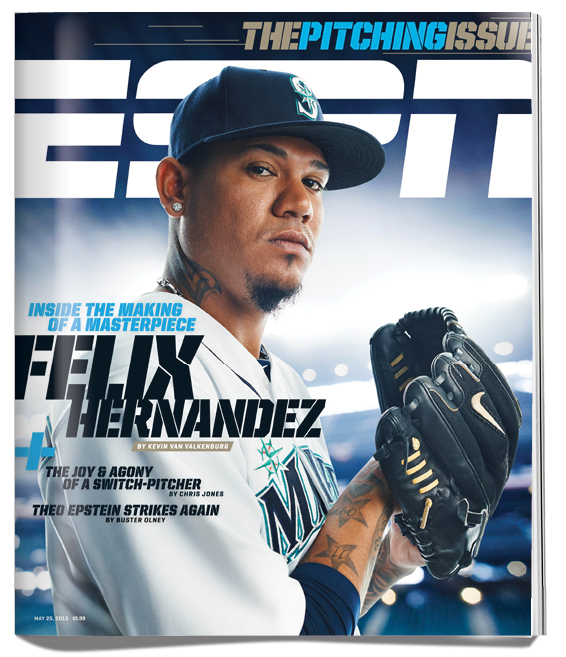 "I truly believe this is my path to the major leagues," he says, "but there were a lot of struggles along the way." In a game of tribes and labels -- hard-throwing righties, crafty lefties -- being the only one of your kind was sometimes a lonely business. Creighton Prep, Omaha's high school baseball magnet, took a pass on him. He walked on at Creighton University, but after his challenging first season, his coach asked him a little too hopefully whether he might transfer. Even after he pitched a streak of nearly 44 scoreless innings in his junior year, he wasn't drafted until the 45th round by the Yankees, with the 1,345th pick. (He returned to Creighton for his senior year, and the Yankees selected him again the next summer, this time in the 20th round.) Baseball clamped the Venditte Rule on him in 2008, and in 2012, just when he was feeling less like a curiosity and more like a fixture with New York, he tore the labrum in his right shoulder. Venditte didn't lose the season, pitching as a lefty, but his right arm never recovered its former velocity. Today, he can't throw much harder than the mid-80s with either hand. Veteran catcher Luke Carlin, now his battery mate, remembers the first time he faced Venditte as a hitter last season. Carlin had seen the radar-gun numbers and wondered how such a soft-tossing pitcher could survive at this level of the game, even if he could do it with both hands. "Then he got me out," Carlin says, another victim of Venditte's time-honed delivery, his uncanny, mesmerizing ability to throw six pitches with two arms without tipping any of them off. "And he kept getting outs." The night after he finds his new home, Venditte enters the game against Colorado Springs in his customary long relief. The Sounds are losing 5-0 in the top of the fourth with two men on and two out. He has warmed up both arms, nearly equally: a couple of pitches with his right, a couple with his left, half a dozen with his right, half a dozen with his left. He finishes with a right-handed fastball straight down the gut and sprints to the mound. Venditte sets up, righty against righty, and stops the bleeding with a popup. He pitches two more shutout innings, throwing 46 pitches in total -- 34 with his right arm, 12 with his left. Erin and his parents watch from the stands, Erin eating the sleeves of her shirt all the while, and they applaud when he finally leaves the field. The Sounds come back to win the game 11-5, and Venditte starts the season with a string of 10 scoreless innings. It's one of those nights when everything, even Oakland, feels finally within reach. "It's beautiful," says Steve Scarsone, Nashville's openhearted manager. When Scarsone played, mostly for the Giants, he was a version of Venditte, less gifted than willful. He learned how to take nearly every position on the field,and he sees his most versatile reliever as a more extreme strain of the same species. "So far, I'm not even going to tell you he's done a good job," Scarsone says. "He's done an outstanding job. He has a pure desire to succeed." The normally silent magician Teller, when asked to explain how he is able to perform his stupefying tricks and sleights of hand -- illusions that seem to defy any rational explanation -- answered: "Sometimes, magic is just someone spending more time on something than anyone else might reasonably expect." Having just watched his son from the stands, Pat Venditte Sr. whispers a pared-down version of the same secret: "It's time." THERE IS ANOTHER one. His name is Aubrey McCarty, a 20-year-old from Georgia, a big Southern boy with a mop of blond hair. By one of those magical baseball coincidences, he is a redshirt freshman at Vanderbilt, rising out of the trees across the street from Venditte's new apartment, leaving Nashville an unlikely proving ground for switch-pitchers. When McCarty was a boy, he saw a picture of Venditte, then still with Creighton, in Sports Illustrated. It was more than just the revelation that he wasn't alone; it was as though a new world had opened up. McCarty's father was soon on the phone to Mizuno, wondering whether he could get another one of those funny gloves. Vanderbilt also happens to be the site of Venditte's first collegiate win for Creighton, and McCarty's coach, Tim Corbin, had watched that victory from the home dugout. "You get spooked," Corbin says today, casting back. "You see it on the roster and say, 'I'll believe it when I see it.' Then the glove switches hands." Even before he'd thrown his first pitch, Venditte had made the Commodores uneasy, like the first rumors of something sinister coming over the horizon. With his own switch-pitcher, however, Corbin feared that McCarty risked being quartered by his talents, thinking that it was enough for him to switch-hit, which he also does. Baseball rewards focus, and he put McCarty on first base. But how often do you have a kid who can pitch with both hands? It was like telling a man born with gills to stay out of the ocean. "That's just such a rare breed," Corbin says. "That's the .0001 percentile." He started sending McCarty out to the mound. Unlike Venditte, McCarty is a natural left-hander. He writes with his left hand, and he eats with his left hand. But his father was a rodeo cowboy; more specifically, McCarty's father was a calf roper. And calf roping is one more of the countless corners of the universe that is set up to favor the right-handed. McCarty learned how to calf rope, which meant that he learned to use his right hand as well as his left. His right arm somehow became the stronger one for pitching, with greater velocity and control. He has hit 93 with it, topping out at 84 with his natural arm. "You can definitely teach yourself to do it," McCarty says. "You just gotta do it." The evidence, he says, is right next door. THE FOLLOWING MORNING, the rental furniture arrives for the new apartment. It includes such Triple-A luxuries as a mattress and a couch. Later that afternoon, Venditte is the first Sounds player out on the grass. In the otherwise empty ballpark, he begins running along the fence from pole to pole. He must trace that line at least 10 times for his body to start feeling right, a superstition he would prefer to call a routine. It's as though hisrituals allow him to keep his balance, each hard-won gain calling for constant maintenance. Then he stretches every inch of tendon and ligament in both halves of his body. A few minutes later, Barry Zito emerges, tall and purposeful, out of the clubhouse tunnel. The two men continue to stretch together, throwing partners on their way to becoming friends. "This game's hard enough one-sided," Zito says. They pick up their gloves. Venditte puts his on his right hand. They are not the same pitchers or men. Zito is a Cy Young Award and World Series winner, rich beyond even a ballplayer's wildest dreams. Venditte still covets a fraction of Zito's reality. But in this instant they are both left-handers hoping for the same call into the manager's office -- You're going up -- and only the less famous one will make history if he gets it. They begin to play catch. Venditte stands on the foul line in left field, and Zito stands maybe 20 feet from him toward center, and they toss the ball to each other like kids in the yard. Then Zito begins moving back, a few steps at a time. Soon they are 50 or 60 feet apart, and Venditte drops his arm into its more familiar sidearm slot, slinging the ball toward Zito, who returns it over the top. Their differences are at their starkest just then: Zito's almost musical four-beat delivery, Venditte's more mechanical catapult. But Zito continues drifting toward center field, 100 feet, now 110, now 120, and Venditte's arm slowly rises at its shoulder, and the two become closer to twins. Still more Zito wanders: 150, 175, 200 feet. Now they have to put more of their bodies into their throws, taking a step before each launch. The distance has leveled them. Venditte might even look the stronger of the two. Zito steps farther out of range. He's 220 feet away, then 230, 240, 250. It seems like a long time ago now, but Zito's left arm was once the essence of possibility. His curveball, the heights it reached and the distance it dropped, made curveballs seem like something more than we might have imagined they could be. Crowds didn't cheer it; they murmured after it, the way astronomers must feel a shiver of doubt when they discover an unnamed star. Now crowds make the same noise when they see Venditte flip his glove from one hand to the other. It's so seamless, at first they wonder whether they've missed something, whether they're seeing things, whether the Sounds made a switch they didn't notice. Then they realize what has happened and begin to do their private arithmetic. Some see division. They can't overcome that first wave of incredulity that arrives with the sight of something they haven't seen before. Freak, they say. Gimmick. But some begin to multiply. Aubrey McCarty has heard there's a high school pitcher in Murfreesboro, Tennessee, who's seeking to join baseball's smallest fraternity. Luke Carlin knows two boys in Texas who are growing up throwing with both hands. They don't look up at Venditte and see a monster. They see double helices and self-belief and fathers who help make impossible futures true for their sons. They look at his six-fingered glove and see how an ordinary man can be made special. They see proof that we can conquer every curse. Zito keeps falling back, 260, 270, 280 feet, as though he could keep traveling forever, as though they are ungovernable and the game they are playing is limitless. Now they are using their whole bodies to deliver the ball to each other. They are planting their feet and flexing their legs and turning their hips and rotating their trunks and whipping their arms and craning their necks. Farther and farther they throw, the ball whistling through the air between them, 300 feet now, as though on a line into each other's gloves. Together, the two of them are defeating gravity. They have mastered distance. 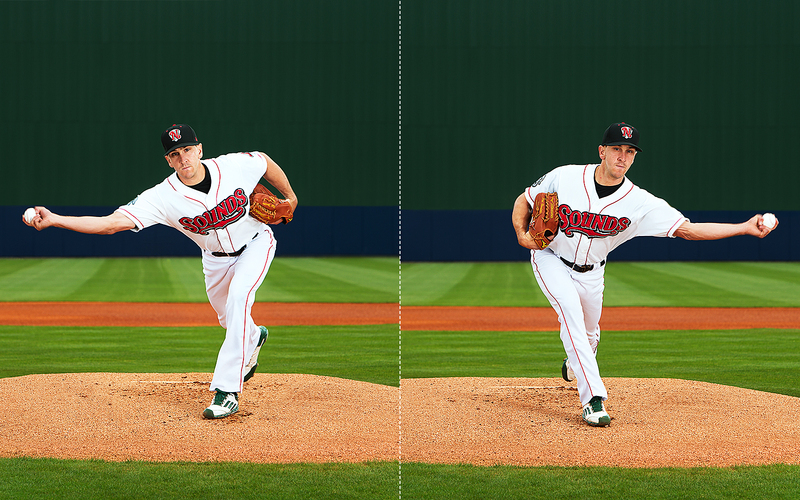 And one of them, the one named Pat Venditte, is doing it with the hand that wasn't born his. Join the conversation about "Show Of Hands." What Is Giancarlo Stanton Thinking?